CD spider is used to attached CD or DVD’s to file, folder, book cover, brochure, catalogue and special CD-DVD covers. Sticks itself. CD spider is used to attached CD or DVD’s to file, folder, book cover, brochure, catalogue and special CD-DVD covers. Sticks itself. 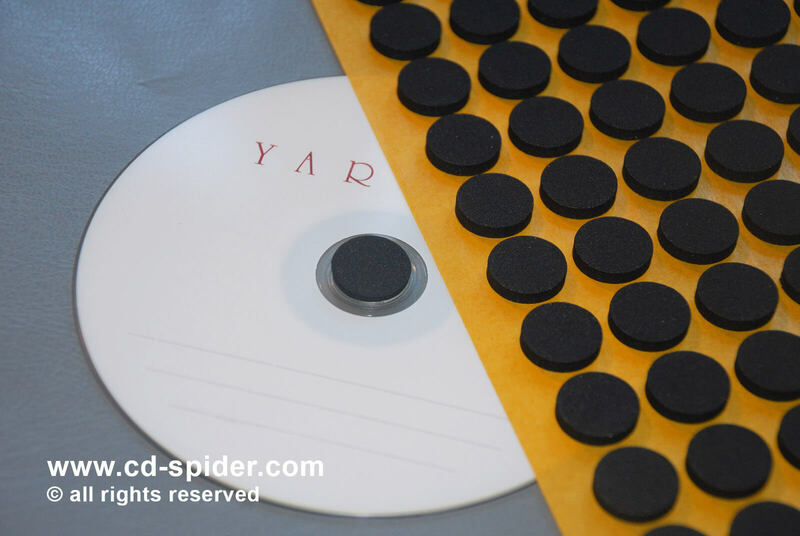 If you need to attach your CDs to promotional material or mailouts, CD spiders (CD Studs, CD foam button, cd hub) are very useful. The spiders are vacuum formed plastic with adhesive backs. Once the paper liner is peeled off, they can stick onto just about anything. Some CD spiders (cd hub's) are very much like the moulded spider found in the centre of the jewel case tray and others look like small buttons . they are economical and effective. Everything went smoothly. The website is functional, the store is easy to use and the package arrived in a short time and in good conditions. The only thing that didn't worked well was the tracking number: it didn't exist in the database of the post office website. But that's only a detail and didn't affected the material. I recomend this website as trusted. The PVC CD spiders are fantastic. No problem with ordering and tracking the order online (First Turkish Post then my local Post). Delivery is on time (6 working days). I am really impressed with the CD buttons and now the plastic file sleeves look fantastic. The website has also improved, nice and easy to navigate well done. Thanks. I received the products without any problems, including some free samples of others too. I got very pleased with their good quality and hope we'll make other deals soon. Everybody who sees the spiders cds ask where I bought them. It worths. There are several suppliers of similar products in Australia but NOT ONE of them can match the range, quality, availability and service that we have received from ASO. 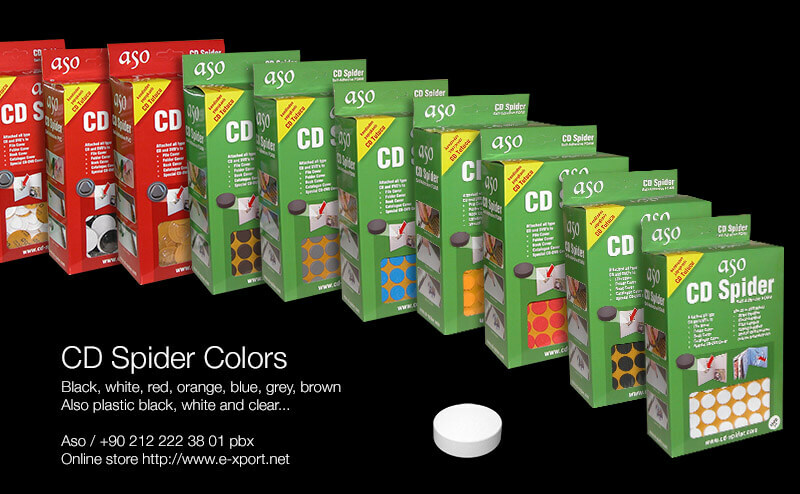 We will buy from no other supplier than ASO. Well done indeed. Very pleased with the products and service. The samples arrived far quicker than I was expecting! They are so versatile and will be perfect for all sorts of projects. Thankyou! Hello, I purchased the foam buttons from yourselves and the service was exceptional - every query I wanted answering was dealt with. The product is brilliant quality and I will be recommending it to other people. All the best. 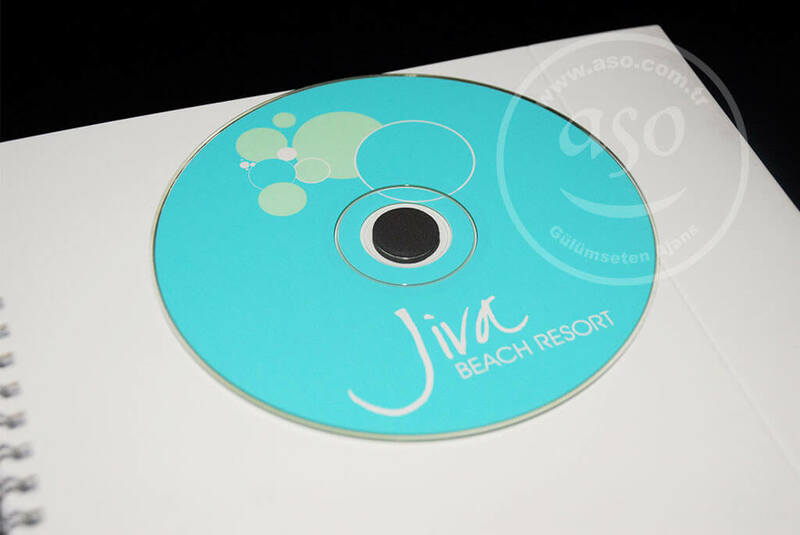 CD spider is used to attached CD or DVD’s to file, folder, book cover, brochure, catalogue and special CD-DVD covers. Sticks itself. If you need to attach your CDs to promotional material or mailouts, CD spiders (CD Studs, CD foam button, cd hub) are very useful. The spiders are vacuum formed plastic with adhesive backs. Once the paper liner is peeled off, they can stick onto just about anything. Some CD spiders (cd hub's) are very much like the moulded spider found in the centre of the jewel case tray and others look like small buttons. they are economical and effective.